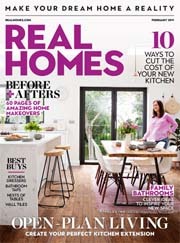 There are difficult second books and albums – authors famously battle to put them into words, musicians struggle to hit the right note – but for Alison Farrell-Price and husband Chris Price, their second self build home was a breeze compared with the first. For one thing, all the groundworks had already been completed as the new house sits next to the oak frame barn Alison built back in 2010. She learned a lot during that first build; lessons she couldn’t wait to put into practice with a second oak frame house, this time a much larger farmhouse-style building. 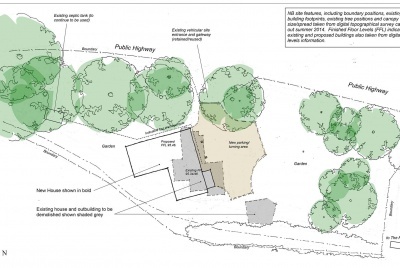 The plot is in a Conservation Area, but planning permission was already in place for the existing house to be demolished and for the land to be split in half, with approval for two new houses. Alison reapplied to split the land one third/two thirds and submitted plans for two carefully detailed period-style properties. 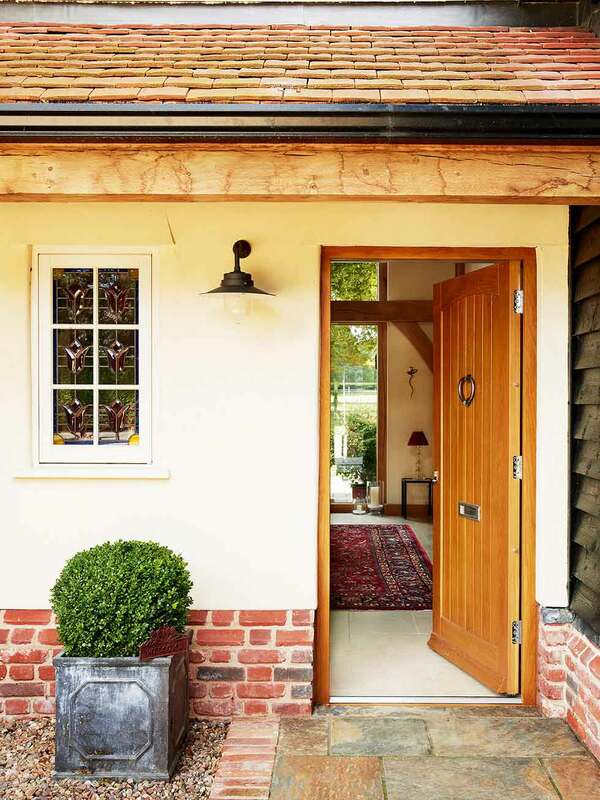 The scheme was designed to emulate a Tudor farmhouse – the couple’s eventual home – with a black weatherboarded barn (which was to be their first self build) alongside it. 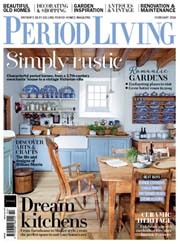 “I used designer Pete Tonks, who did the plans for our barn, to do the drawings for the second house to get us through planning,” says Alison. “Conservation officers often prefer artistic hand-drawn elevations to show how a finished building will look and how it will sit in the street scene — difficult to achieve with a CAD drawing. “I also held a meeting in the village hall so that everyone had a chance to see our proposals,” she adds. “We had unanimous support from the local residents because our plans were more in keeping with the historic village setting than the designs that had been previously approved.” The planning department agreed and permission for the scheme was granted. 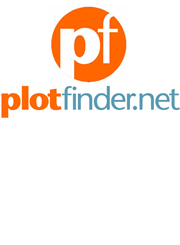 Next followed an arduous excavation of the plot. The ground was in a very poor state as the previous owners had planted numerous conifers on the site which possessed unstable clay soil. Alison called in a structural engineer, who advised that the whole site should be dug out and piled, with concrete rafts constructed to form the foundations for the two houses. By the time building began on the second house, however, all those days spent knee-deep in mud on a very boggy, rain-soaked site, were distant memories. Alison and Chris were living in the completed oak frame barn, so keeping an eye on the build was much easier second time around. “Project management is definitely a full-time job. 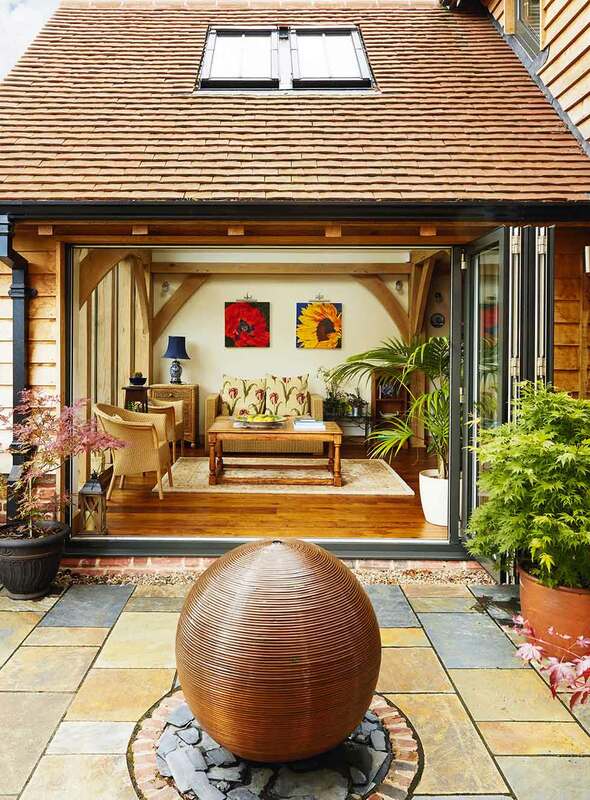 If you’re buying every single screw and every timber, which I did, and only using subcontractors, you need to be there all the time,” says Alison. In addition to living next to the site, another valuable lesson Alison learned from the first build was that in order to project manage effectively, you need to know how your build fits together from the start. Working through the drawings with the architectural technologist helped in other ways, too, as Alison explains: “It’s an essential way of making sure you have allowed enough contingency. I’d say you need 20 per cent contingency. 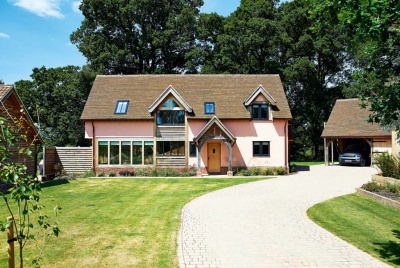 With one-off oak frame houses in particular, you do need to allow enough in the budget as they’re slightly less predictable than more conventional builds. With a project like this, you also have to be able to envisage the finished product. You can’t afford to change your mind, because that costs money,” she advises. Everything was planned upfront, from the Lutron lighting system – with the exact positions for all the lights plotted before the build started; the main area where husband Chris got involved – right through to designing the oak frame in the kitchen specifically to accommodate the Lacanche range cooker. But despite all the forward planning and visualisation, nothing can quite prepare for the excitement of the frame going up: “Watching your frame arrive on the back of a lorry and seeing it go up, that’s a key moment,” says Alison of the frame, which was provided by Westwind Oak. (Structural insulated panels encase the frame for an airtight finish). 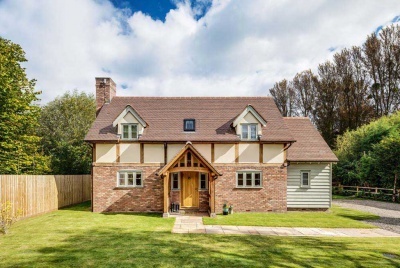 During those 10 months, the house slowly took shape using traditional materials, such as handmade clay tiles, oak fascias and rafters, lime render and bricks laid in a Flemish bond with lime mortar. The front of the house also features an oak jetty, as well as pargeting; the latter being a traditional decorative plasterwork. Great attention was paid to the period detail to fit in with properties in the area. Alison even obtained Building Control approval to set the windows further forward than would normally be permissible, in order to emulate the period look. Inside, the aim was to create a space flooded with light and to maximise the rural views. 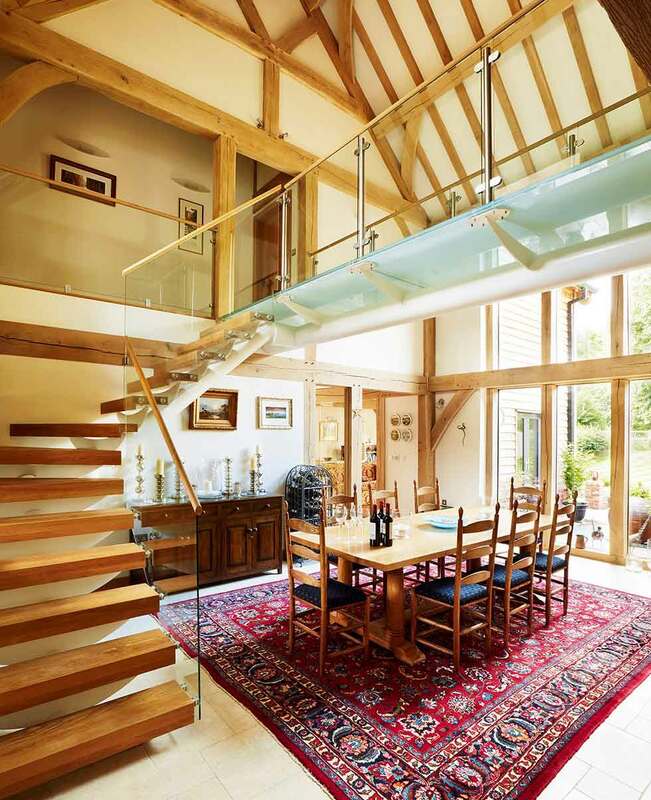 Within a largely open plan design, the oak frame has been adapted and used to divide the space into separate rooms, each with a distinct feel and function. The centrepiece of the finished home is undoubtedly the dining hall, vaulted up to the roof with oak rafters. A laminated glass bridge with glazed balustrade crosses the centre of the dining hall. The near-transparent material allows light to pass through the structure and ensures that the room and the view beyond aren’t bisected. In the living room, a magnificent Bathstone fireplace has been custom made, making a real feature of the Clearview stove. 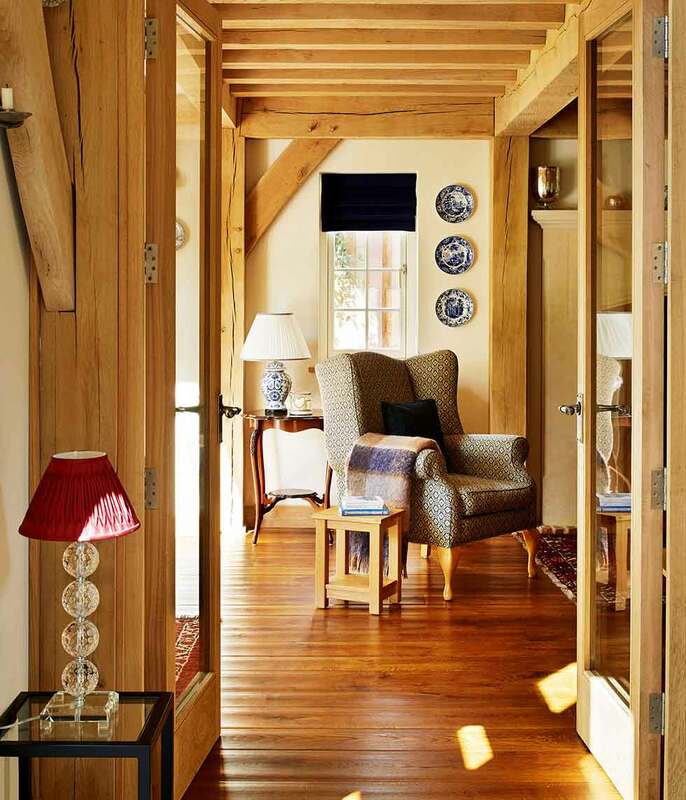 Together with the lower ceiling and traditional exposed ceiling joists, it makes for a cosy space on winter evenings. 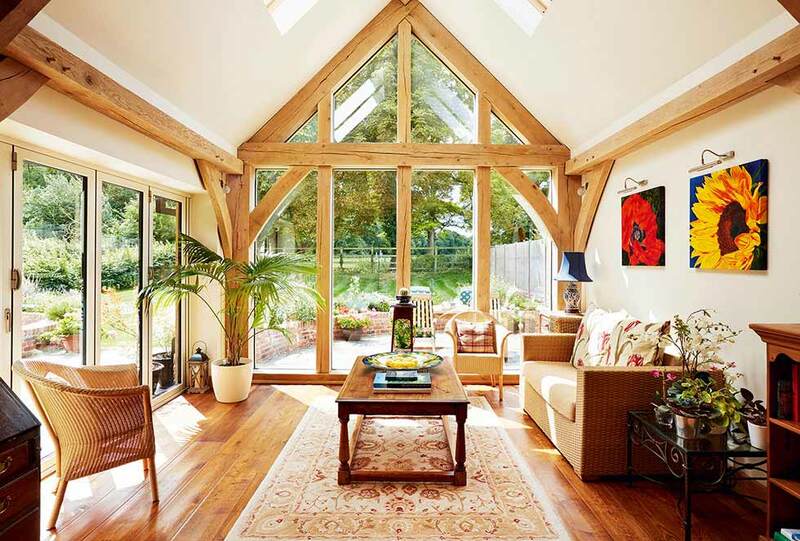 The recent resurgence of interest in green oak frame buildings has brought with it some particular challenges — not least of which is how to fit inflexible glass windows into an oak frame that will be slowly drying out over the course of around 10 years. This has been made all the more difficult by our modern-day predilection towards introducing large expanses of glazing. 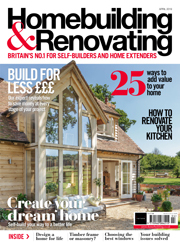 This issue has, however, been addressed in Alison Farrell-Price’s oak frame house, which features fixed-panel glazing by Black Pig, a specialist carpentry business entirely devoted to green oak timber frames. 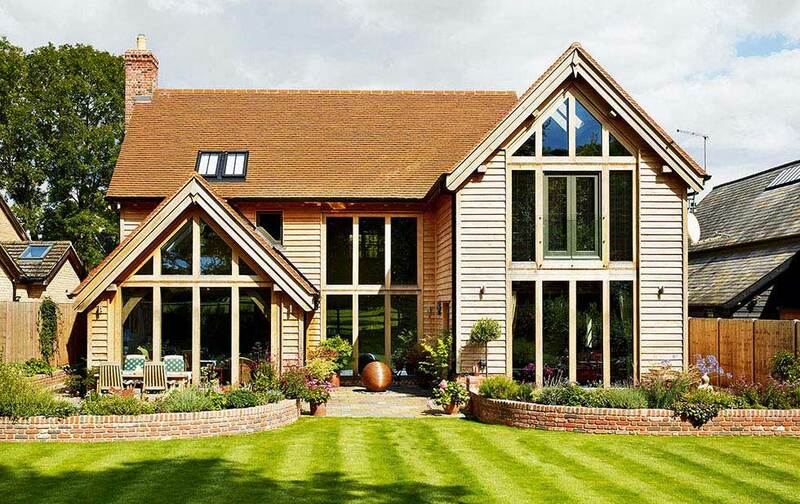 Black Pig’s take on face-applied glazing involves cladding the entire structural frame to protect it and to provide a waterproof seal. The insulated glass units (IGUs) ‘float’ over the external frame, using a covering strip of oak on the outside of the glazing, exactly in line with the frame. That way, as the green oak frame shrinks and seasons over the years, the glass remains in place. Weather seals are made of EPDM rubber, giving longevity and allowing movement, and no silicon or other mastics are used as these can degrade or tear over time. Drainage is also built into the Black Pig system to extend the life of the IGUs. 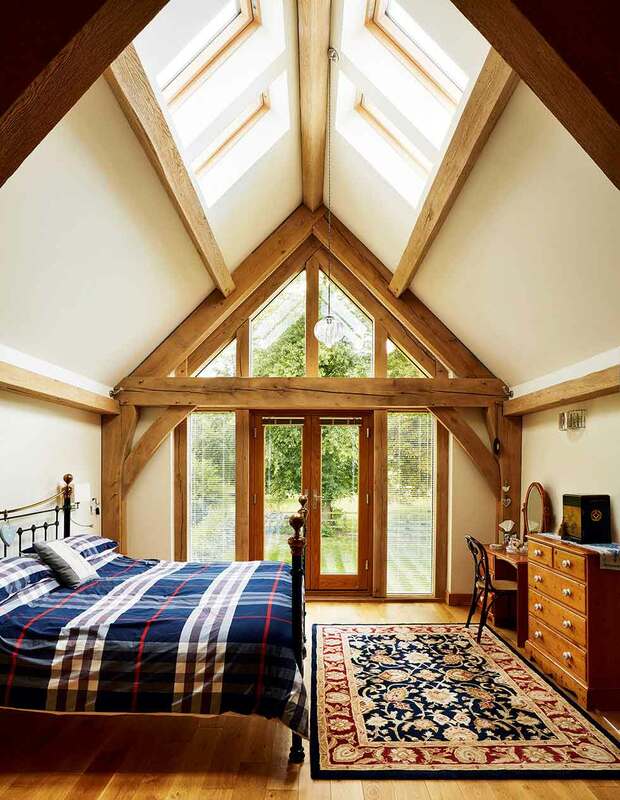 It’s worth bearing in mind that, unlike ‘standard’ off-the-shelf windows, companies such as Black Pig are best contacted early on in proceedings – as early as the design stage – and that they not only supply the system, but their specialist team of carpenters also install the product on site. 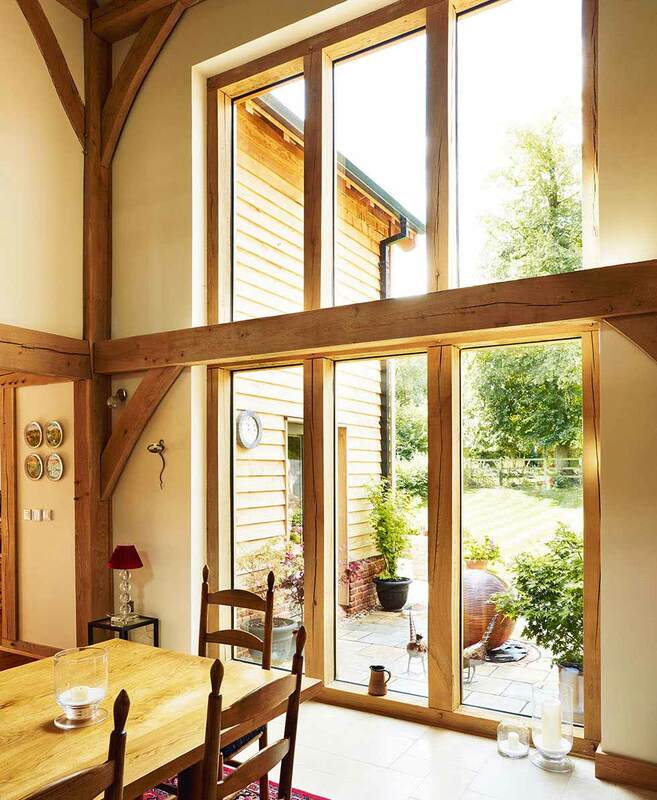 A further, very considerable, advantage of fixed-panel glazing for these magnificent timber framed windows is that the entire oak frame is visible from the inside, uncluttered by additional joinery or sealants. 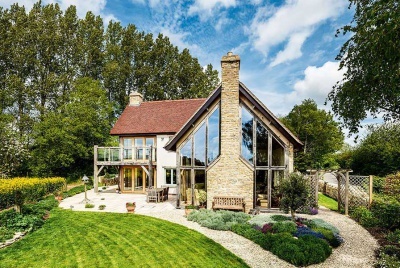 Put an extra window frame in there and the impact of the most important aspect of the whole build – the oak frame and your view through the window – could be ruined.